With a background of 25+ years as a professional multi-musician, percussionist, flute, guitar player and singer, but also dedicated to the work on sound (sound engineer, composer, producer, remixer and healing dj), co-founder of the French duo ELEA, Swann has performed in ovhttp://www.zen-and-sounds.com/swann-sound-healerer 1500 concerts all around the world. Swann became a certified sound therapist after training at the Peter Hess Academy in Belgium (with Brigitte Snoeck) and the College of Sound Healing in the UK (with Sheila Whittaker). He gives sound healing sessions all over Europe in yoga and well-being centers, meditation and yoga festivals, yoga and sound healing retreats and special events. 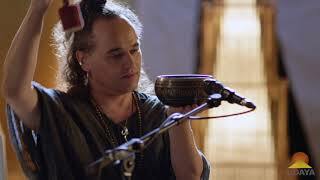 He works with several symphonic gongs as well as a large choice of Himalayan bowls (from Tibet, Nepal, Bhutan, India), therapeutic tuning-forks and many other sacred shamanic instruments.